A casting time diagram established by F. C. Bennett – or H. H. Pokorny who slightly modified the casting time values determined by F. C. Bennett – is considered as particularly reliable. This casting time diagram is shown in Fig. 1. Many authors determined the optimum casting time as a fraction of the solidification time and indicate a quadratic dependence between the medium casting wall thickness sm and a casting time constant kt according to eq. 1. In eq. 3, the casting time is indicated in ms and the mean casting wall thickness in mm. Here, the casting time values lie within a close range of 12.5 to 75ms at a mean casting wall thickness of 1 to 6mm. If the casting time is increased further, this can lead to cold shuts and, according to J. Kopf, to a considerably higher risk of rejection. In a detailed study on the determination of casting times and flow lengths, B. Nogowizin proposes to determine the optimum or maximum casting time based on the condition that the critical volume of the solid phase is formed when the alloy reaches the critical or admissible stagnation temperature T = Tkr. According to his statements, it can be assumed that, due to the high rates of inflow and pressures, movement of the melt within the mold cavity during pressure die casting is possible at the anterior flow front up to a solid-phase volume fraction of approx. 70 to 80% (nkr = 0.7–0.8). These values have also been confirmed by Q. Han et al. who attributed the long flow paths in pressure die casting at a relatively high proportion of solidified phase also to the melt movements and the influence of pressure. 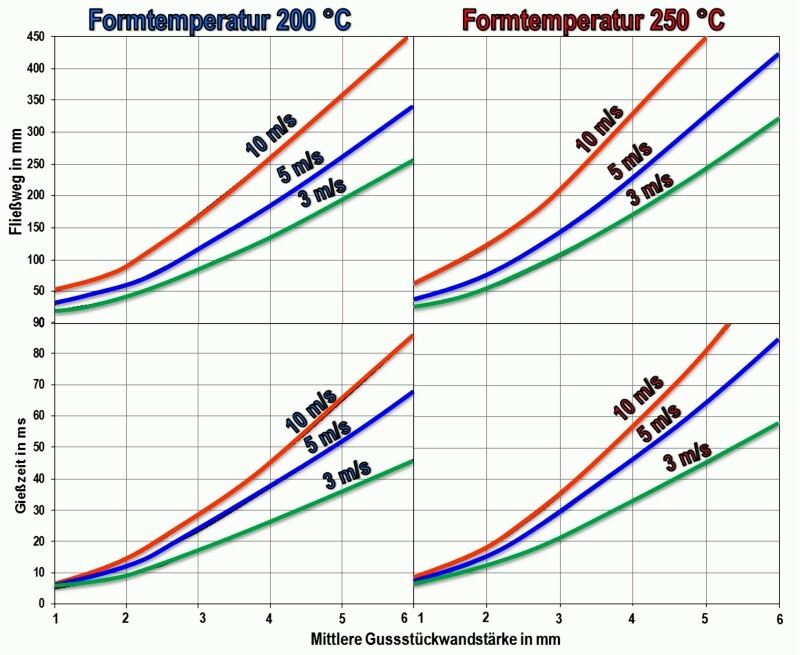 Moreover, it is assumed that the non-stationary mold surface temperature will suddenly rise from its initial temperature up to a constant mold surface temperature when heated due to the thermal radiation of the flowing metal front and the extremely short time of contact between the moving volume element and the mold wall. Therefore, the mold surface temperature needs to be determined using a mold temperature rise coefficient based on the comparison of the flowing metal volume element and the mold temperature. 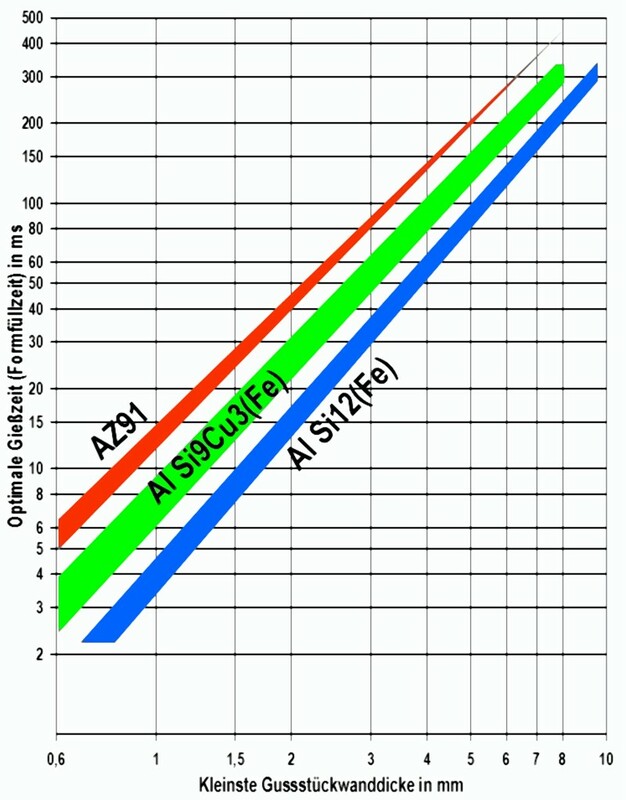 As this is a complex calculation and the thermophysical data for the relevant alloy must be known, the results for the alloy AlSi9Cu3(Fe) are shown in a casting time diagram in Fig. 2. 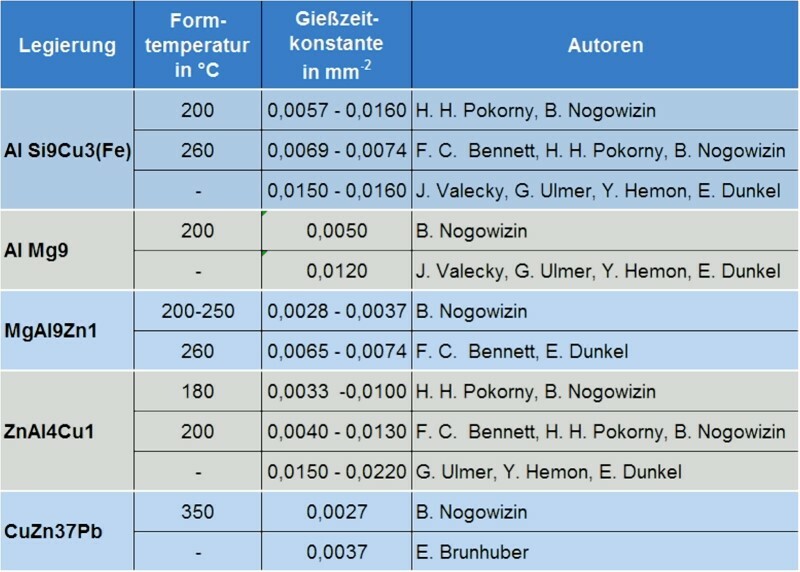 Comparing the calculations carried out by B. Nogowizin to the actual casting times of castings determined by W. Venus and indicated in Table 2 reveals a relatively good correspondence. Under the same conditions for casting time and casting pressure and a uniform superheating to above the liquidus temperature, aluminum alloys with a low solidification interval or eutectic alloys such as AlSi12(Fe) show the best mold filling properties. This is consistent with experiences gathered in practice where eutectic alloys are primarily used for thin-walled, complex castings having long flow paths. 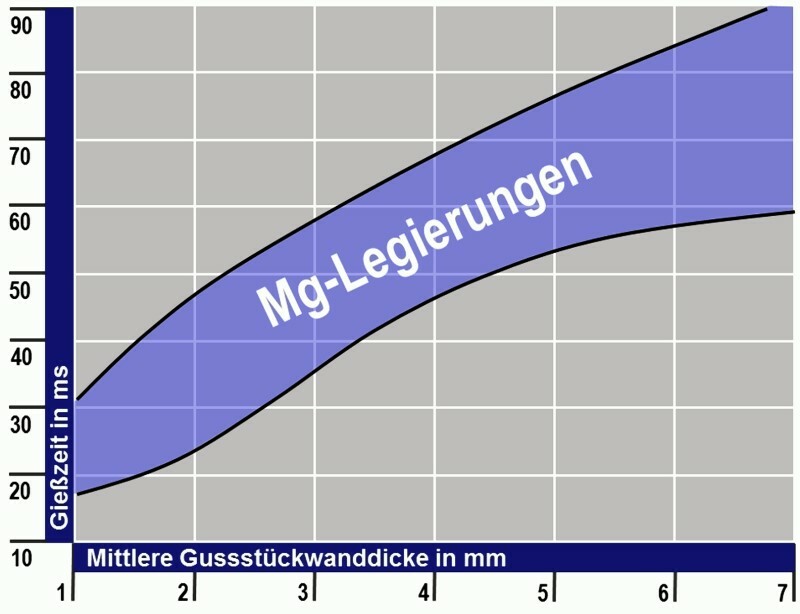 For castings made of magnesium alloys, A. Schuster provided a casting time diagram (Fig. 3). In a chosen mean casting wall thickness range of 1 to 6mm, a casting time of 15 to 80ms can be derived from this diagram. This casting time interval for magnesium alloys complies with the casting times for aluminum alloys determined according to J. Kopf. This means that castings made of magnesium alloys can be produced using a similarly short casting time as that employed for those made of aluminum alloys. However, due to the lower heat content (thermal capacity) and the associated more rapid solidification, they require higher gate speeds and lower mold filling times in practice. Therefore, the casting times in Fig. 3 only apply at sufficiently high mold temperatures. In addition, when using magnesium alloys with a low aluminum content (M20, S21, AE44, etc. ), shorter casting times should generally be aimed at than for alloys with a higher Al content (AZ91, AM 60, AJ62, etc.). In eq. 4, the casting time is yielded in ms if the mold temperature is inserted in °C and the mean casting wall thickness in mm. This empirical equation has proven to be reliable for zinc alloys. The admissible casting time is shown in Fig. 4 which also includes the casting times recommended according to H. H. Pokorny for comparison. 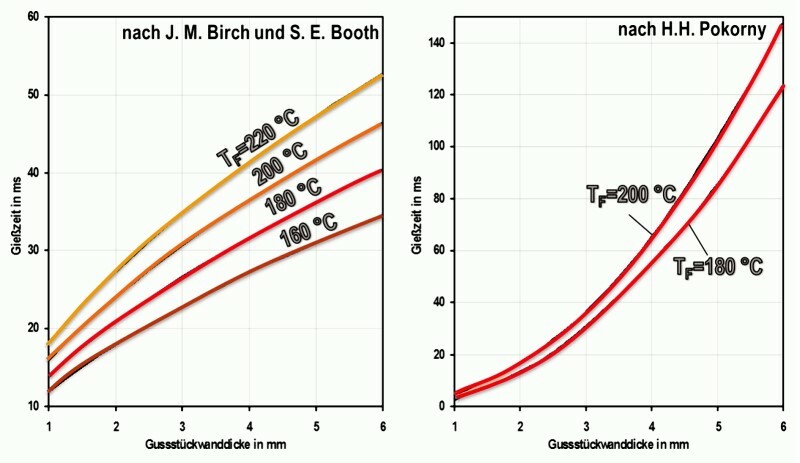 The casting time values of J. M. Birch and S. E. Booth lie within a very close range of 12– 18 to 35–53ms for a mean casting wall thickness of 1 to 6mm. According to this data, zinc alloy castings should be produced using a shorter casting time than applied to those made of magnesium and aluminum alloys. Neither in eq. 3 or eq. 4 nor in the casting time diagrams, casting time is defined as a quadratic function of the mean casting wall thickness. As the casting wall thickness increases, the casting time does not rise any more than with a quadratic relation. Therefore, thick-walled castings subject to high structural demands can be expected to provide better results if the castings are made using a very short casting time. F. C. Bennett: Fachgerechtes Konstruieren von Druckgießformen zur Vermeidung von Anlaufschwierigkeiten, Giesserei-Praxis (1968), no. 3, p. 46-51. H. H. Pokorny: Fachgerechte Druckguss-Anschnitttechnik - Mit 80 % Wahrscheinlichkeit fehlehrfreie Gussstücke vom ersten Schuss an, Giesserei-Praxis (1969), no. 24, p. 421-429. B. Nogowizin: Wahl der Hauptparameter von Druckgießmaschinen mit einer horizontalen Kaltkammer, Giesserei-Praxis (2000), no. 7, p. 281-286. J. Kopf: Beitrag zur Theorie und Praxis des Druckgießvorganges, Giesserei (1970), no. 20, p. 633-641. N. Nogowizin: Gießzeit und Fließlänge der Schmelze im Formhohlraum beim Druckgießen, Druckguss-Praxis (2005), no. 6, p. 213-221. J. M. Birch, S. E. Booth: Beziehung zwischen Gießparametern und der Oberflächenbeschaffenheit von Zinkdruckguss, Giesserei-Praxis (1991), no. 11/12, p. 196-199.